Your vacuum comes with one. Even your blender comes with one. But your PC--something that costs a whole lot more and is likely to be used daily and for tasks of far greater importance and complexity--doesn't come with a printed manual. Thankfully, that's not a problem any longer: PCs: The Missing Manual explains everything you need to know about PCs, both inside and out, and how to keep them running smoothly and working the way you want them to work. A complete PC manual for both beginners and power users, PCs: The Missing Manual has something for everyone. PC novices will appreciate the unassuming, straightforward tutorials on PC basics, such as hooking up a monitor, keyboard, mouse, printer, and scanner. Families will enjoy sections on networking several computers to share an Internet connection, sharing one monitor between two PCs, connecting portable media players, and creating a home theater system. Adventurous PC users will like the clear photos explaining how to take your PC apart and replace or upgrade any failing parts; IT professionals will be grateful to have something to hand to their coworkers who need solid, trusted information about using their PC. 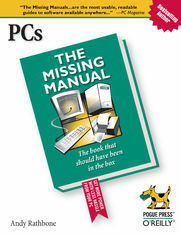 In PCs: The Missing Manual, bestselling computer author Andy Rathbone delivers simple, reliable advice on the kinds of things PC users confront every day. He shows you how to connect and configure today's must-have devices (including digital cameras, portable music players, digital camcorders, and keychain drives); burn CDs and DVDs; scan and fax documents, and more. His section on the Internet explains how to choose the best Internet Service Provider and web browser for your needs; send email; find information quickly on the Web; share photos online; set up a blog; set up a webcam; access TV and radio through the Internet; and shop safely online. And Rathbone delivers plenty of guidance on keep your privacy and your PC safe by installing firewalls, creating safe passwords, running antivirus software, removing spyware and adware, and backing up important files.